…pretty much the same accusation that is commonly made about the Chinese Government and their attempts to reinterpret or revise historical fact to suit their own political purposes. I wonder just where this sort of nonsense is going to go since it is undoubtedly indirectly sponsored by the Chinese Government or, rather I wonder if there is going to be a Chinese Dokdo in the future. There are historians in Korea that make claims such as these—one of the books is by the former vice-chancelor of Daejeon National University, while the others are by historian Oh Jae-seong—but such claims are not widely accepted within the Korean historical community (as the Korean consulate in Shanghai explained when those maps first became news in China in May of last year). In fact, Koreans are much more concerned with what many consider to be creative map-making in Chinese textbooks (both in the PRC and the ROC)—see here and here. The above books are not Korean textbooks. 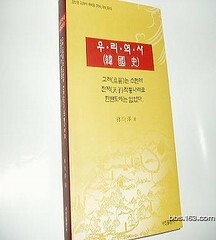 If it’s an official textbook, it has the title “교과서”. Anyway, it is sure to be eccentric people, including Koreans. I’m Korean and don’t know the territory images. The map is from a book published by some marginal extremist group of ultra-nationalist amateur historians. Very few people in Korea (and nearly nobody in the professional community) would consider their wild claims seriously. Needless to say, nothing like it is to be found in Korean textbooks. There are some nationalist distortions in the textbooks, but on much, much smaller scale. The second image, a book with a yellow cover, is of a book published in 2002 by a retired history professor. 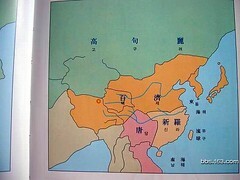 The poor-quality color maps (notice that the northern Japanese island of Hokkaido seems to be missing) may have been created by the author, Professor Lim. 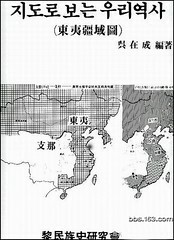 All of the other black-and-white images http://bbs.news.163.com/mil/968958,52.html ) circulating around Chinese websites are from several books or maps published by the same author, historian Oh Jaesung. The materials were published many years ago, not recently, and one of the images looks doctored. As a Korean citizen who is unusually attached to his patria in this rootless age of ours, I appreciate that you two are doing a yeoman’s work in defending the sanity of the contemporary Korean historical consciousness. Nor am I surprised by your attempt to inject some perspective here, for you two are both among the most balanced and rational commenters in the Korean Blogsophere–where rationality is often an orphan. But I cannot in good conscience agree with the seeming thrust of your message. Namely, I object to your seeming effort to simply dismiss these outrageous Korean historical claims on China as rantings of a lunatic fringe. There is a point at which a well-meaning defense transmogrifies into an unreflective apology that refuses to believe that Rome is indeed burning. May I be as bold as to even say, to reverse Burke’s elegant formula, sometimes our helper is our adversary? For instance, speaking from my own intellectual background in political philosophy, the one-sided apology of Nietzsche as purely an aesthete to counter the fascist accusations by Walter Kauffman (or the attempt to portray Leo Strauss as an ordinary “liberal” rather than the father of neoconservatism by his legion of defenders) have distorted Nietzsche as much as corrected pernicious misperceptions of him. And likewise, the fact of the matter is this: There is a serious disconnect between the South Korean public historical consciousness and what most impartial scholars posit as Korean history. Moreover, much of that disconnect does involve the size and power of ancient Korean kingdoms of Gojoseon or Koguryo. While it is true that no textbook (as far as I know) claim that the Chinese heartland used to be Korean, such a belief is ubiquitous in the popular culture. I have certainly encountered numerous Korean students living abroad who believe it and blame Chinese chroniclers and their Korean sycophants for distorting the true Korean history. In fact, as I have written elsewhere, such a view is the standard view among Korean television historical dramas. In “Yeon Gaesomun,” perhaps the most anticipated and costliest Korean historical drama of all-time, it is explicitly said that China was Korean land in the time of Gojoseon. And in the context of the drama, this is advanced as a historical fact, not fiction. Likewise, in an upcoming drama about Dangun, the putative mythic founder of Gojoseon, Dangun’s territory supposedly spanned from Tibet to Sakhalin. And online Korean historical fora are absolutely replete with a similar historical understanding. So we do have a serious problem in the South Korean historical consciousness or imagination. And we don’t need Hegel nor Kojeve to tell us that, at least in East Asia, history often commingles with reality to produce an ugly brew between nations. So I propose that we talk about addressing this problem rather than intoning that it doesn’t exist. Translation: Koreans are correct. So we need to reunify to form one nation again. China+Korea=??? Of course, we’ll still call that China. Nice ethnic slur, Celn. Would you tolerate a Westerner using the word “Chink” on your blog, Jackie? Yes, that comment gives me some hard time too. I feel I should apologize to all my Korean friends and readers of this blog for not deleting that comment. I think I should take this opportunity to explain a bit. I have not yet deleted a single comment on this blog. Not deleting the comment does not mean I agree with all the comments put on this blog. I just want to keep the channel as much open as it can be so that we can have different voices. Hope that is not just a dream. I respect your respect for freedom of speech. As the blogger, it is good for you to criticize commenters who make personal insults and ethnic slurs. Some bloggers delete messages and ban posters while others chastise the offending commenter. I think you should leave it because Koreans need to know that there is rising anti-Korean sentiment in China, and one reason for that rise is Korean nationalist displays like the recent silver medalist speed skating team at the Asian games. It’s not uncommon that two brothers in a family fight for some minor issues, not to mentions those disputes involve history, politics, territories, etc. I think as long as we can sit down and talk, we still have the chances not to fight. I really appreciate your valuable input. Your input help develop some meaningful and in-depth discussions. The Korean author who authored the book where “United Silla” is bigger than Song Dynasty do have a point. I have not read the book so I am postulating. I’m not an expert in the history of this region either. I have only started reading on and off the past months. Anyway, it is possible that “United Silla” is bigger than Song Dynasty if we consider the dynasties esp. the Jin Dynasty that controlled those regions to be part of “United Silla” if they could trace their lineages back to “Korea”. Peng, happy Chinese new year! I don’t think the Korean mass is still dispassionate. They are threatener for China now, we need catch the ball before the bound! I don’t think Korean are threatening China at this moment. Apparently, the history they learn is different from what we learn in the school. The problem surfaces as we are getting more contact with one another and better informed. Could you let me know which is the most effective rss reader to subscribe for your web page? concentrated acid may cause systemic toxicity and eventual cardiac arrest after interfering with the body calcium metabolism. restoration. It can be open like pergola or can have tightly thatched or slatted cover. Next Next post: How China is viewed in Africa?